The Calendar is a great way to view everything you have to do for all your courses in one place. You can view calendar events by day, week, month, or agenda list. The calendar also includes access to the Scheduler, which is an optional scheduling tool in Canvas. The Calendar spans all courses and displays information for each of your enrolled courses and groups. In the navigation bar, you can choose to view the calendar in Week, Month, or Agenda view . The view you choose dictates the style of the calendar window . By default, the calendar appears in Month view. The sidebar shows a quick-view calendar , your list of courses and groups, and undated items for your courses and groups. To view the iCal link for exporting your Canvas calendar to other calendar apps, click the Calendar Feed link . 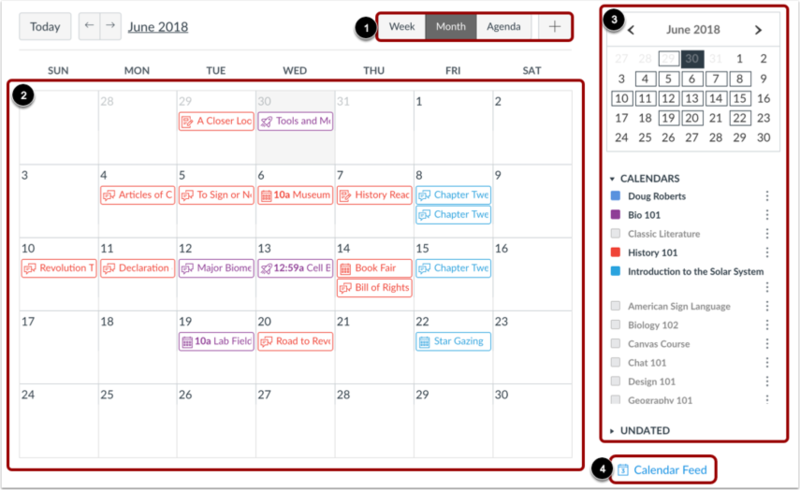 Each calendar view shows any assignments, events, or to-do items that have been added to the calendar. Events can be added at any time in the navigation bar by clicking the Add button. You can add assignments and add course events, and all users can add personal events. If your institution is using the Scheduler tool, you can also create Scheduler appointment groups. 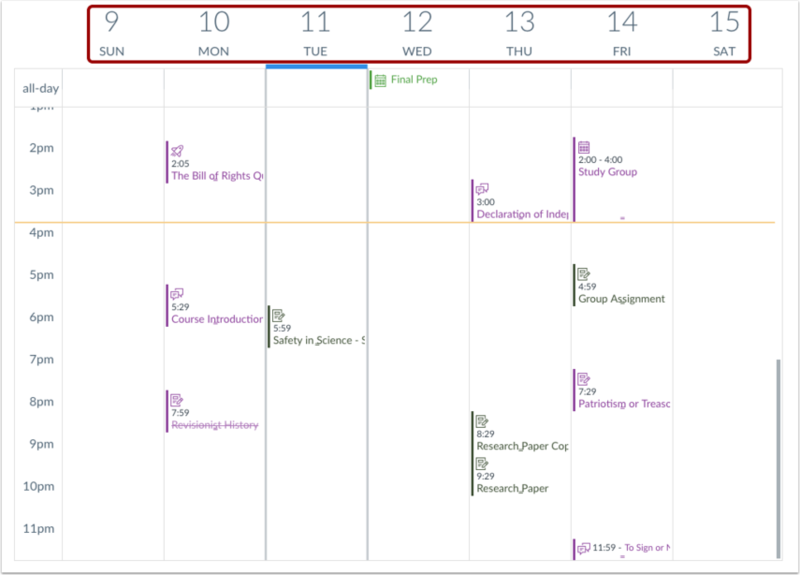 Each personal, course, and group calendar is identified by a separate color that populates the calendar view. Associated items for each course or group will appear within the calendar view for each calendar . By default, the first 10 course and group calendars will be selected and appear in the calendar view. To hide a calendar, click the box next to the name of the calendar . Calendars that are not active within the calendar view display as faded text . Note: Canvas will assign an arbitrary color for each calendar unless a custom color is chosen. Each calendar contains 15 default colors, but you can insert a Hex code to create any color of your choice. Colors set in Dashboard course cards also update in the calendar. Expanding the Undated items link will show you a list of events and assignments that are not dated. 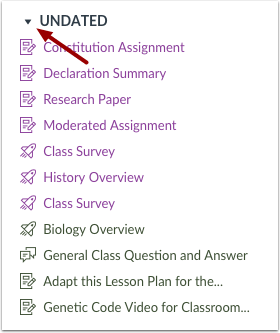 The assignments and events will be differentiated by icons and by the personal, course, or group calendar color. You can assign due dates to undated items by dragging and dropping them into the Calendar. In month view, click the arrow buttons  to move from month to month. To view events for the current date, click the Today button . To view a specific date, click the month link  and type a date in the date field  or select a date from the calendar . Assignments are shown with an icon next to the assignment title. The icon reflects the assignment type: Discussion , Assignment , Quiz , or Events . Non-graded items with a to-do date also display in the calendar for a course . Each item on the calendar is color-coded to match the courses or calendars in the sidebar. To view full details for an assignment or event, hover over the item . Calendar assignments can also be crossed out , which is a simple way to keep track of assignments. Assignments are crossed out when the due date has passed and all submissions have been graded. All-day events display the Events icon and do not include a specific event time . If you want to extend an all-day event across multiple days, hover over the edge of the event until you see a black arrow . Drag your event across all required dates in the current month. 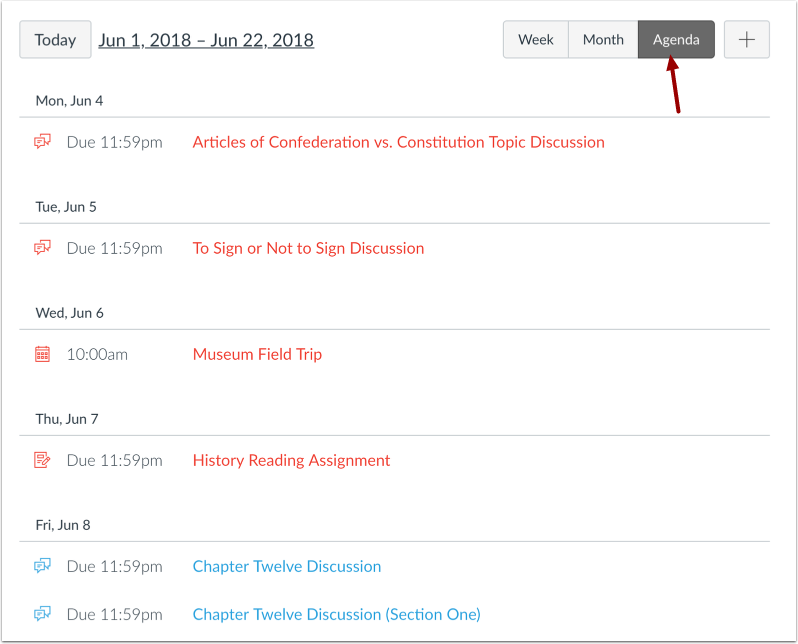 If a course has sections or individual students with varied assignment due dates, you will see the same assignment shown multiple times. Depending on the assignment setup, the assignment may appear on the same date or on multiple dates. Students will only see their specific assignment due date. 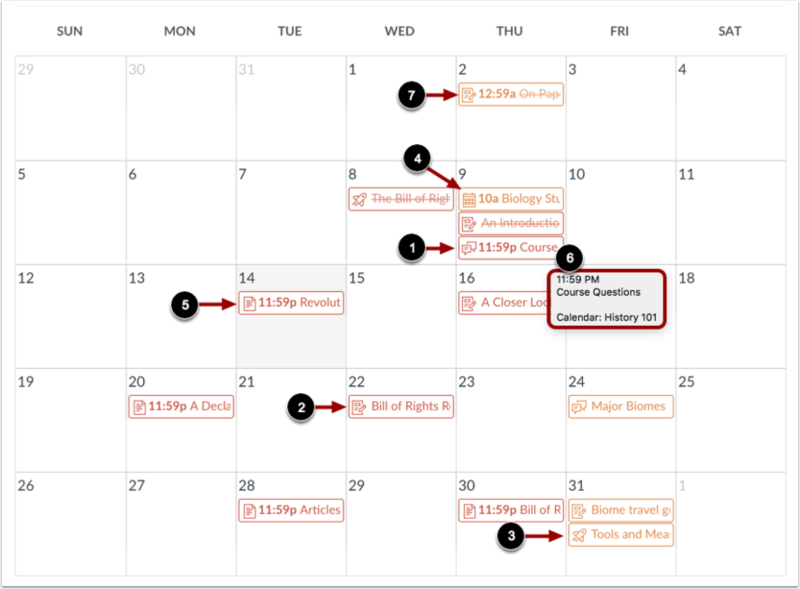 Your calendar view may show entire assignment and event titles as part of the calendar entry. This calendar view is only available in the Month view and can only be enabled by your institution. The wrapped assignment and event title view allows you to view the entire calendar item without having to hover over the title. To view the calendar by week, click the Week button. The Week view shows all calendar items by date and time. Note that some assignments may be due at 11:59 pm, which appear at the bottom of the calendar view. All-day events appear at the top of the calendar week. These events do not include a specific event time. 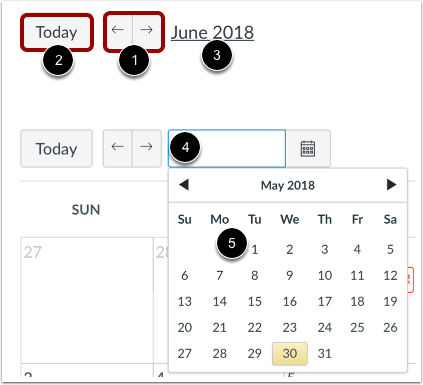 Like in the Month view, if you want to extend an all-day event across multiple days, hover over the edge of the event until you see a black arrow. Drag your event across all required dates. In Week view, you can only drag your event to the end of the week that you are viewing. To view all your calendar items in an agenda format, click the Agenda button. If your institution has enabled Scheduler, you can manage Scheduler events directly in each course calendar. To add an appointment group, click the Add button  and select the Appointment Group tab . 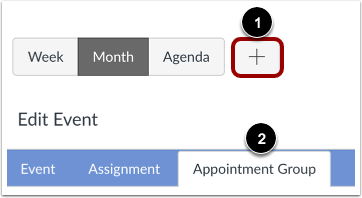 Once created, the appointment group will display in your calendar. You can view or edit groups and remove students directly from the course calendar as well. Previous Topic:How do I run Roll Call Attendance reports in a course? Next Topic:How do I filter the Calendar view by course as an instructor? Table of Contents > Calendar > How do I use the Calendar as an instructor? Re: How do I quickly delete or hide past events in my current course calendar? Re: How do I filter the calendar view by course section in Canvas as an instructor?